I'm trying to simulate SRAM to DDR component from Nexys 4 DDR, I'm using Vivado 2017.2 and i want to write on DDR. 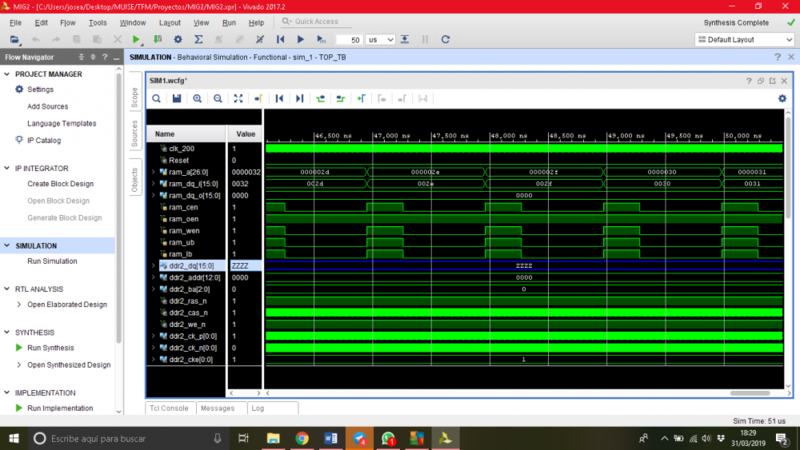 I have respected timming about all entrande signals (RAM) but i never write on DDR, I always see 'ZZZZ' at ddr2_dq signal. Here is a screencapture about simulation. What am i doing wrong? Are you assigning initial values I.E. 0 or 1 for the signals that are interacting with the project? Here is a project that i believe uses the SRAM to DDR component for the Nexys 4 DDR. Here is the reference manual for the SRAM to DDR component. Here is my TOP module and the testbench, i think that i am assigning initial values. Here is a forum thread that deals with simulation of the SRAM to DDR component. Is there a specific issue with the SRAM to DDR component you are concerned about?